The use of a rope and pulley to maintain tension on the rope making rig appears in several patent documents. 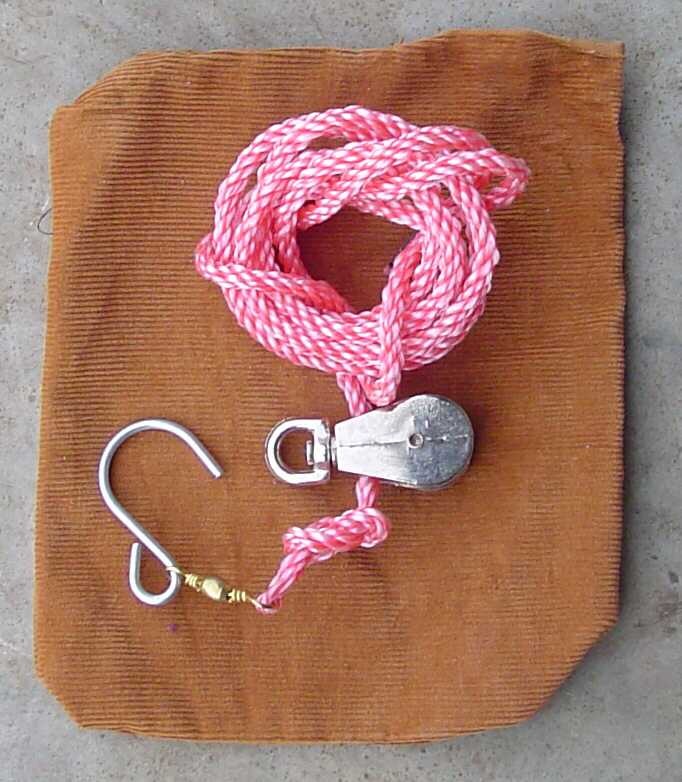 The traveler hook is connected to a swivel connected to the end of a rope that goes through a pulley to the ballast that sets the tension. Anything that provides the right amount of weight on the rope will work, from sandbags full of coins, to soup cans, to bricks and steel bolts. Plan on the ballast being dropped more than once, so the ballast and the floor surface it hits must survive the encounter. PT1 Hook attached to a barrel swivel, onto a 5 foot polypropylene rope, going through a pulley. Included is one empty sandbag. The barrel swivel is good for beginners, as the swivel doesn't turn quite as easy as the ball bearing swivel in the PT2 kit. PT2 Hook attached to a ball bearing swivel, onto a 5 foot polypropylene rope, going through a pulley. Included is one empty sandbag. 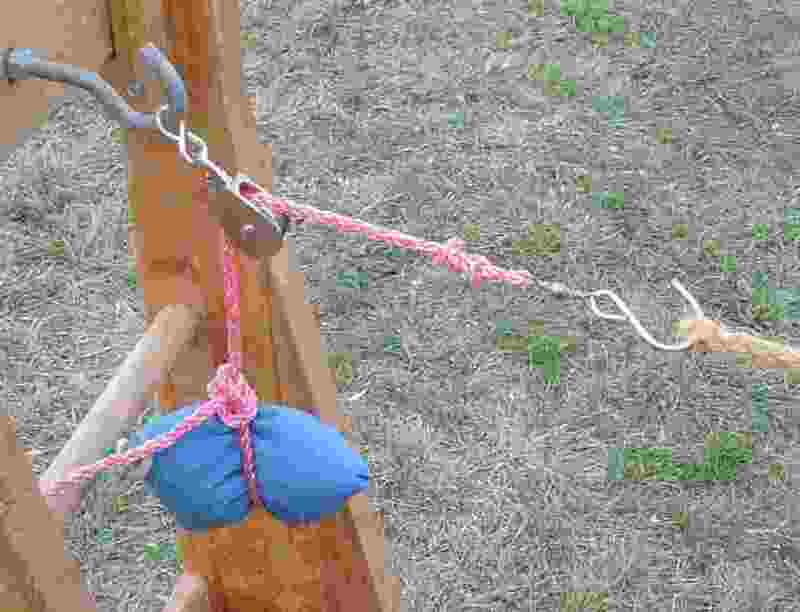 You may have to restrain the traveler hook to prevent rotation during lay up if your twine or yarn has a lot of twist. These travelers are intended for making rope less than say 20 feet long. Be sure to lubricate these swivels with grease or oil to maintain low turning resistance. See Parts Ordering Page for ordering information. The hook used on these travelers is made of 0.120" steel wire stock. The opening is about one inch wide. 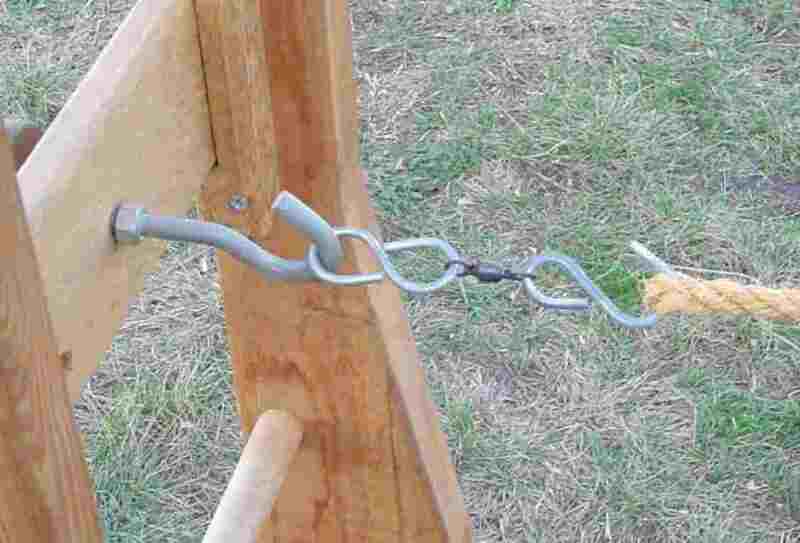 This hook will begin to release, straightening out the wire stock, at about 40 pounds. Hooks are available in packages of 3 (part number HL1) and 50 (part number HL2). The amount of ballast necessary for rope making depends on the diameter and length of rope you are making. The following are samples that will work, but may not be optimum. Experiment as necessary to refine the ballast quantity. ounces Making scale cordage with thread - as for model sailing ships. 3-5 pounds Hard fiber such as sisal, hemp, polyester, etc, finished rope diameter 3/8" to 1/2", lay up length to 15 feet. 5-8 pounds Hard fiber as above, finished rope diameter 1/2" to 3/4", lay up length to 15 feet. Longer ropes, harder lays, and thicker finished diameter all warrant an increase in the effective tension applied. Scale up the traveler equipment to match the desired tension level. I use cloth (muslim or denim preferable) bags filled to 50-60% of the volume with coarse sand and fine gravel. That way the contents won't leak out, and the bag can be dropped without rupturing. Make several bags to provide a range of ballast, as the bags can be tied together to increase ballast. Make some small bags in one and two pound increments, to fine tune the load. Once you sew the bag closed, then write the weight onto the sandbag with a permanent marker. If you pull the ballast into the pulley, then stop operations, until the rope machine or the traveler can be moved to regain travel distance between the top of the ballast and the pulley. Traveler Kit T3 - An open hook and an S-hook are mounted across a ball bearing swivel for use connecting a sled, hand truck, or wagon as the tension device. Made of heavier hardware than the PT series travelers. The picture at right shows one installed on the crank hook of a hand truck that is drug by the twisting action of the strands. See Ordering Page for ordering information.